NASA officials released this photo in honor of the space agency's 55th birthday celebrated on Oct. 1, 2013. Image uploaded Oct. 1, 2013. Most NASA employees will be able to celebrate the space agency's 55th birthday from the comfort of their own homes today (Oct. 1). In an odd twist of fate, the partial government shutdown that began at midnight has effectively grounded NASA on the anniversary of its first day of operations. NASA launched into existence on July 29, 1958 when President Dwight Eisenhower signed the National Aeronautics and Space Act into law, but the space agency didn't officially open its doors until Oct. 1 of that year. Since its creation NASA has landed 12 astronauts on the moon, successfully landed four rovers on Mars, and sent the first manmade object into interstellar space. 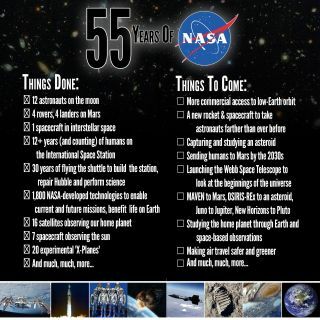 But the space agency has still has big plans for the future. From capturing an asteroid and parking it next to the moon to landing astronauts on Mars, NASA is still aiming to push the boundaries of what is considered possible.